At least 100 people are reported dead following the derailment of a train in India’s northern Uttar Pradesh state, with more than 150 injured, police say. Fourteen carriages of the Indore-Patna Express derailed just after 03:00 local time on November 20 near the city of Kanpur. Rescuers are still trying to reach the injured and recover the dead from the twisted carriages. The cause of the crash near the village of Pukhrayan is not yet known. Most of the victims were located in two carriages near the engine which overturned and were badly damaged. By afternoon, rescue workers were still using heavy machinery to try to reach survivors. One passenger whose carriage did not derail told the Associated Press the train was going at normal speed. It stopped suddenly, said Satish Kumar, then restarted shortly before the crash. Many anxious relatives gathered at the station in Indore, where the train began its journey, holding pictures of loved ones, the Times of India reported. Indian PM Narendra Modi tweeted: “Anguished beyond words on the loss of lives due to the derailing of the Patna-Indore express. My thoughts are with the bereaved families. Narendra Modi said he had spoken to Railways Minister Suresh Prabhu, who was “personally monitoring the situation closely”. On his own Twitter account, Suresh Prabhu warned that “strictest possible action will be taken against those who could be responsible for accident”. 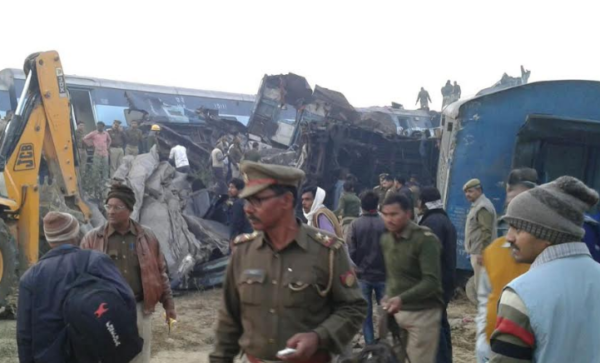 Suresh Prabhu said an investigation into the crash would begin immediately and compensation would be paid to “unfortunate passengers who died and to injured”.